Someone in the organization wants to make a change and advocates for the initiative. This begins the b2b buying process. You might call this the champion, mobilizer, or internal change agent. They are focused on solving a particular problem or taking advantage of what they see as strategic opportunity. Contrary to what you might expect, this person quite often is not in official positions of leadership. This often starts with a lower level role investigating solutions. What they do have in common is a desire and will to move the organization forward. Internal discussion ensues about whether to solve the problem, often causing a lot of internal conflict and disagreement. This conflict arises because of risk aversion to the costs or other resources involved, resistance to change in general, or other emotional and political reasons. At this stage they are not discussing suppliers, just the general problem and solution. CEB research shows that group conflict peaks only 37% of the way through the b2b buying process. Out of these discussions the backbone of informal (but sometimes formal) “buying group” is formed. 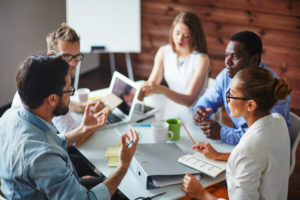 This group gets larger in later stages of the decision making process, but this group decides whether or not to pursue solving the problem at hand. At this stage you need to equip your internal champion with buyer enablement tools. This early buying group either reaches consensus to proceed forward with an actual solution, or the project is abandoned or put on pause. If the buying group agrees to move forward, they (usually led by the internal champion) begin evaluating potential solutions and begin evaluating different suppliers. To this point they have not engaged directly with any sales teams yet, preferring to do early investigation on their own. The buying group makes a short list and begins evaluating more thoroughly. At this stage they may be seeking conversations with B2B sales teams. They are looking for reasons to eliminate some options to make their decision easier. At this stage, especially in industries where feature/benefit has reached some level of parity among suppliers, the buying group looks for how they are serviced during the sales process as the main determinant for their decision. By this stage, many things have changed in the buyers’ business, so as they work on deciding who the specific supplier is, and they start talking specific costs, they revisit all of the reasons they are doing it in the first place. Either through social validation from other customers that have worked with a supplier, industry influencer recommendations, guarantees or trials, the buyer wants to reduce risk. The champion especially has put their reputation on the line and they are not only evaluating what it will do for their business, but also their own standing inside their organization. By this point the buying group largely knows which organization they want to work with, but they are looking at all of the details. Excitement and motivation peak as the B2B buying processes climaxes with the signing of the agreement. Both the supplier and the buyer are excited to provide and receive the benefits they discussed during the buying process. Trust is high. The supplier needs to take advantage of the strong motivation to get implementation done as quickly as possible. This is a critical moment to consolidate the trust the buyer has put in the vendor.